Residential : 2/26 Damson Ave. 2/27 Damson Ave. 3/01 Nectar Ave. 3/01 Southmoor Dr. Vehicle : 3/01 Edwards Ave.
2/24 Donna Landing, 46, of Galloway was arrested by Ofc. Kerry Baerman for Driving While Intoxicated. 2/24 Robert Whedbee, 48, of Estell Manor was arrested by Ofc. Justin Butler for Aggravated Assault. 2/28 Bryan Sullivan, 20, of Brick Twp. was arrested by Ofc. Ron Gorneau for Driving While Intoxicated and Underage Consumption of Alcohol. Harmon Smith IV, 20, and Kyle Polgar, 20, of Brick Twp. were arrested for Underage Consumption of Alcohol. 3/01 Ethan McCracken, 22, of Galloway was arrested by K-9 Ofc. Kevin Welsh for Possession of a Controlled Dangerous Substance and Possession of a Hypodermic Needle. 3/02 Brian Allen, 23, of Gallowaywas arrested by Ofc. Gary Brenner for Driving While Intoxicated. 03/02 Vimal Patel, 18, of Galloway was arrested by Ofc. Steve Garrison for Possession of Marijuana under 50 grams and Possession of Drug Paraphernalia. 2/28 A 17 year old male of Galloway was arrested by Ofc. Chris Magazzu for Possession of a Controlled Dangerous Substance, Distribution of a Controlled Dangerous Substance and Distribution within a school zone. 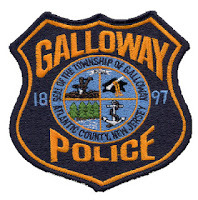 3/02 A 17 year old male of Galloway was arrested by Ofc. Steve Garrison for Possession of Marijuana Under 50 Grams.